The 2011 Chevrolet Aveo (or Viva) has to be a more competent econobox than the one it'll replace, able to compete globally against Japanese, Korean and even American competition; Based on these first interior images, it may have a shot. 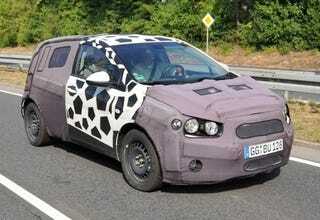 This heavily camouflaged 2011 Aveo was spotted in Germany outside an Opel factory undergoing some instrumented testing with some engineers who somehow got mini-car duty. The exterior looks similar to an Aveo Wert saw on his tour of GM's design studio a week ago, with a very scary-looking rear end mated to a front end that isn't quite big enough to be fitted with a bow tie and grille. But the big news is the first shots of the interior that seems to balance a techno-look against Chevy's latest interior trend of a wraparound cabin. There appears to be dash-top storage and a complete set of repetitive controls on the steering wheel. Seems like the design uses a combination of the Chevy Beat/Trax/Groove triplets from the 2008 Detroit Auto Show. Previous rumors of a name change to the Chevy Viva still run rampant, but with so much turmoil at GM these days we'll just have to wait and see.